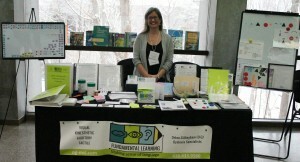 Exhibiting at the 11th Annual ONBIDA Literacy and Learning Conference held in Toronto at the Ontario Science Center. Liisa Freure also presented a workshop entitled “Beyond Magic E” an introduction to Syllables – what they are and what they are not! Liisa Freure exhibits at the ONBIDA Literacy and Learning Conference on March 5, 2016.